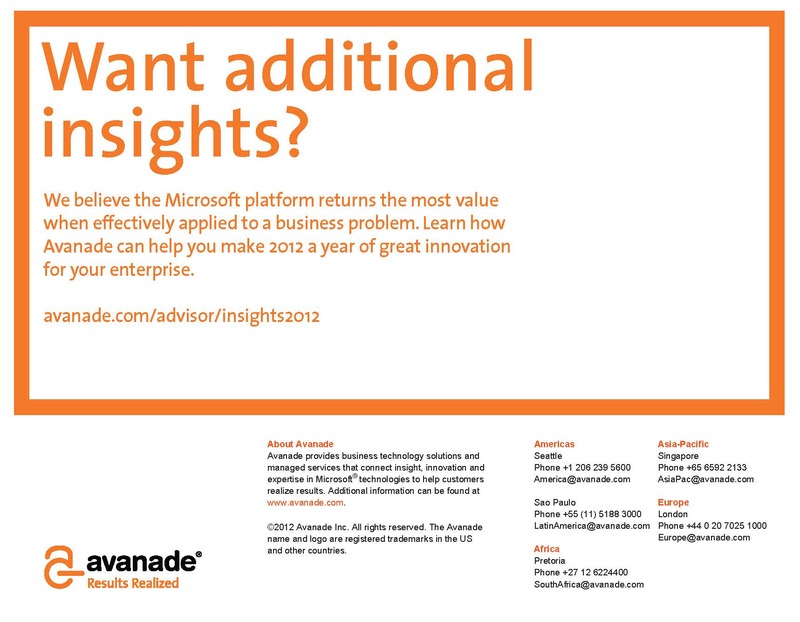 Avanade is a global IT consulting, business technology solutions, and managed services company. It’s the largest Microsoft-dedicated solutions provider in the world, with over 15,000 Microsoft certified professionals deployed to 60 offices in 20 countries. 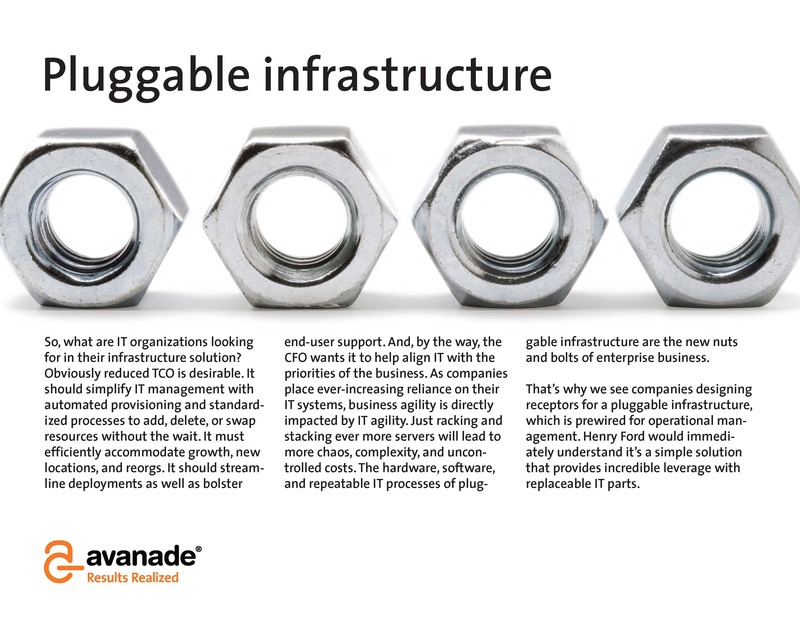 Headquartered in Seattle, and a subsidiary of Accenture, Avanade combines the industry’s leading Microsoft technical know-how with unrivaled Accenture consulting experience to enable new IT initiatives that achieve the priorities of the business. 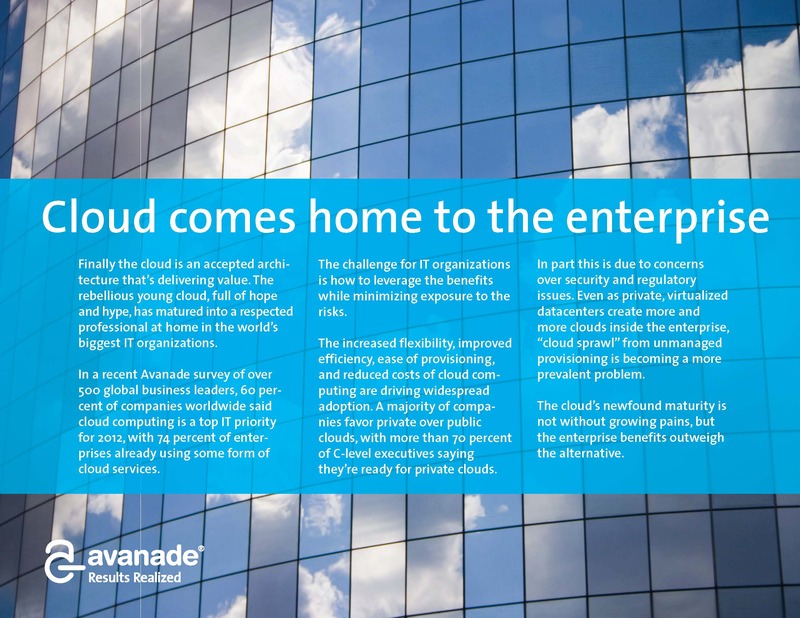 With over a billion dollars in revenue, Avanade serves many of the largest global multinational and governmental organizations—and competes for those contracts against IBM, HP, Infosys, and other top IT enterprise services providers. 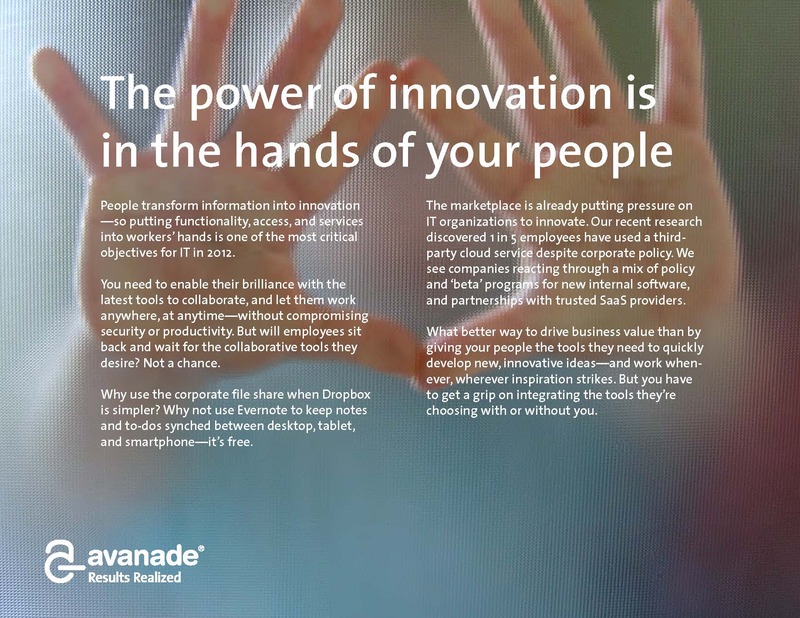 As a way to communicate how they combine insight, innovation, and expertise to provide IT solutions that deliver real business results, Avanade focuses on thought leadership initiatives. 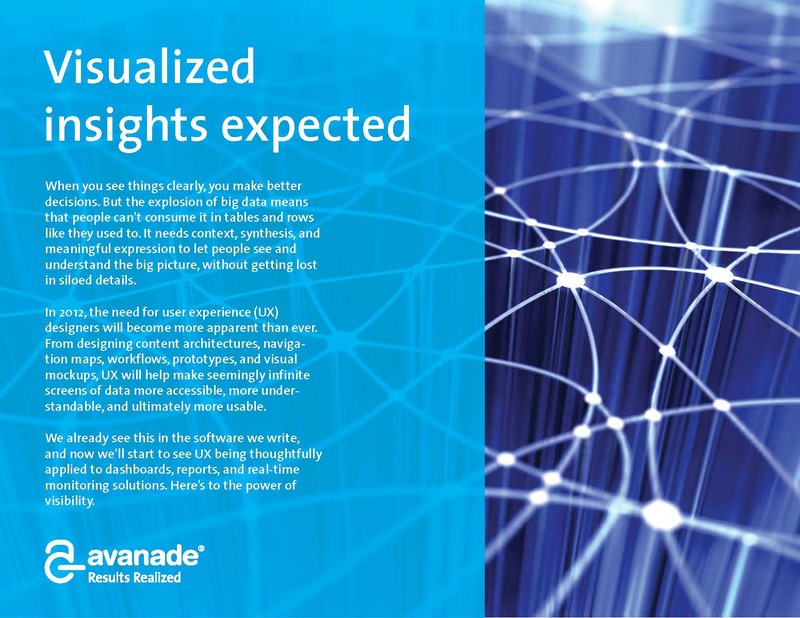 This provides a “look ahead” perspective to customers and prospects and demonstrates the strategies that drive Avanade solutions. 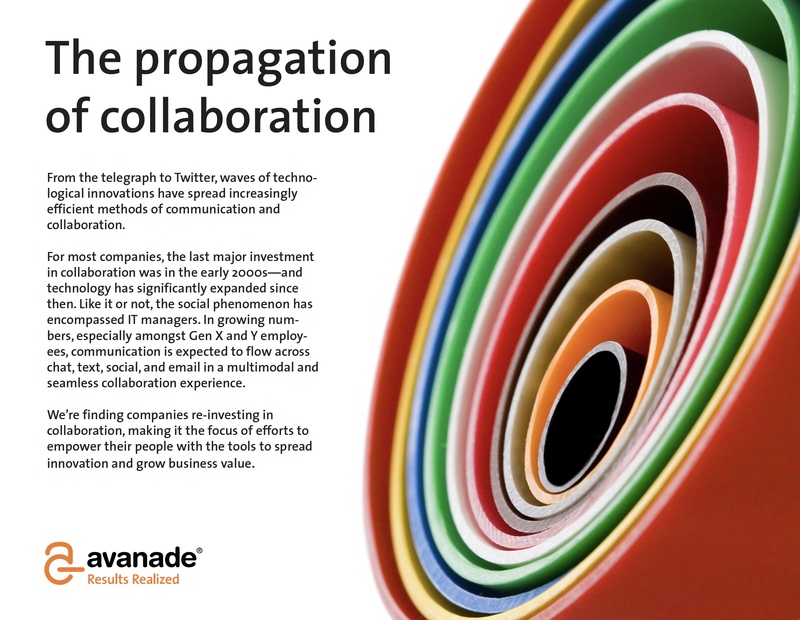 At the end of 2011, Avanade engaged me to create a high-impact thought leadership piece to kick off the new year 2012. 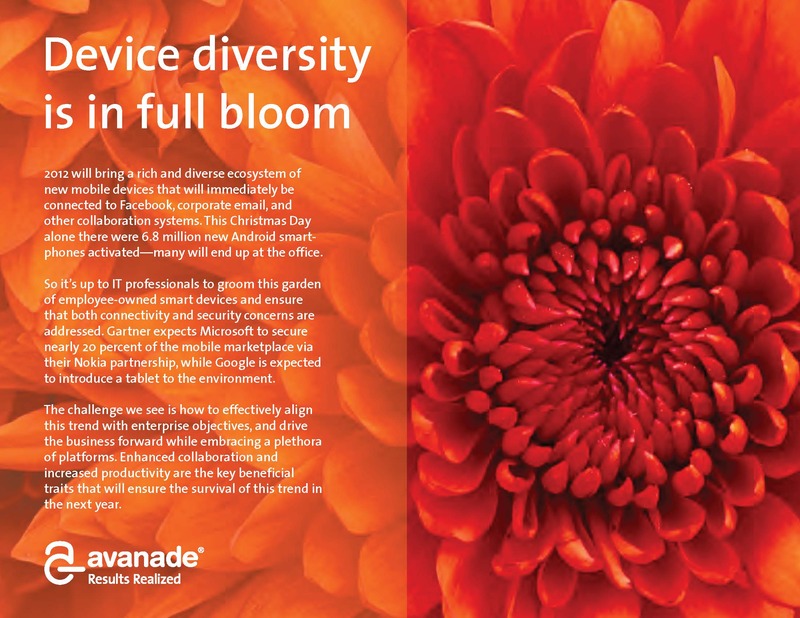 Working with Avanade marketing, I conducted executive interviews and then provided a creative treatment for a multi-page booklet covering six key technology trends shaping enterprise organizations in 2012. Trends covered include device diversity and Bring Your Own Device (BYOD), how enterprises’ handle the rich ecosystem of new mobile devices—and how IT professionals must groom this garden of employee-owned smart devices. But this Consumerization of IT (CoIT) goes beyond devices brought into the workplace to include applications and cloud-based services like Dropbox or Evernote employees are choosing instead of internal corporate solutions. Other trends spotlight demographic shifts affecting IT. Recent Gen X and Y employees are proving to be hard-working and innovative—but they communicate and collaborate with chat, text, social, and other methods not sanctioned by corporate policy. Companies must catch up and empower their people with the right tools in order to speed innovation and grow business value. Insight 2012 was used as a campaign by corporate marketing and then released to the field as an interesting ice-breaker for regional marketing efforts.